← Rose M. Rivera, CMA, C.Ph. 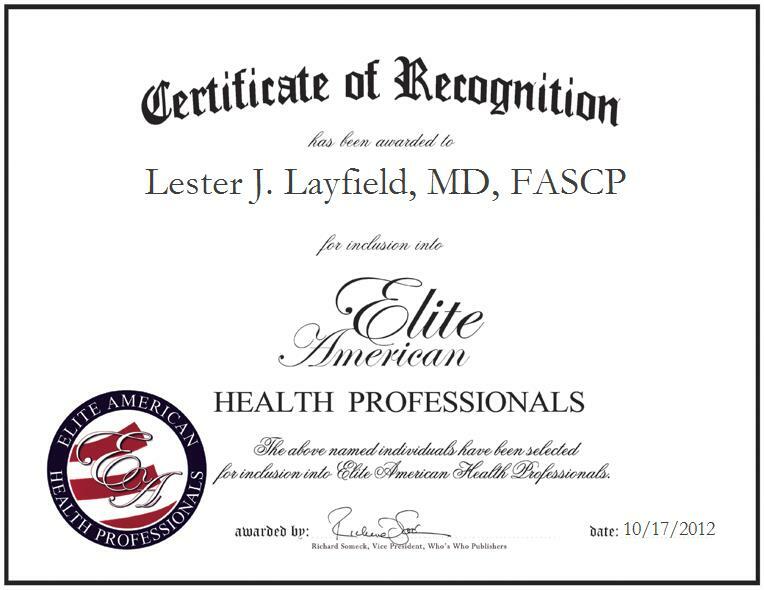 SALT LAKE CITY, UT, October 17 2012, Lester J. Layfield, MD, FASCP, Professor and Chair of the University of Missouri Columbia, has been recognized by Elite American Health Professionals for dedication, achievements, and leadership in surgical pathology cytology. As a professor and chair of the renowned public research university located in the state of Missouri, Dr. Layfield brings forth a diverse and sprawling skill set to the health care institute, as he is responsible for handling faculty evaluations, clinical pathology and cytology. He is also in charge of managing clinical signouts, and molecular pathology reports. For nearly three decades, Dr. Layfield has been nurturing and cultivating ever-emergent talents in the areas of evaluation, clinical pathology and cytology, and he continues to strive for excellence in his every endeavor. He was inspired to pursue his career path by an innate enjoyment of the visual elements demonstrated throughout the industry. He earned an MD and Bachelor of Science from the University of California, Los Angeles. He earned a Residency and Fellowship from the University of California, Irvine. She has since remained abreast of trends and developments as a member of the American Society of Cytopathology, USCAP and JAMA.